Dining as art—designers create dazzling restaurant interiors and installations. Today, eating out is often a high-drama opportunity to immerse yourself in not only good food and conversation?but in a vibe that makes the humdrum everyday world feel far, far away. It’s no wonder that restaurants have become outlets for some of the most creative interiors in the world. 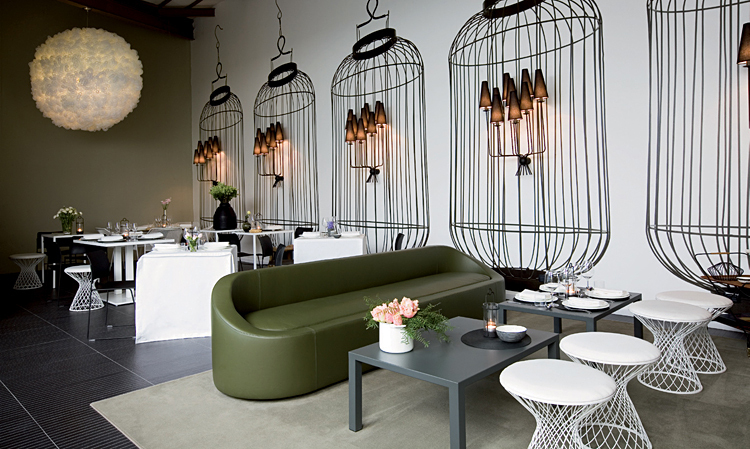 Designers have incorporated technology, art, and nature among other themes to create a world for diners to escape to. Eat Out!, a 288-page tome published by Gestalten, featuring a wide collection of wonderfully designed eateries ranging from fine dining restaurants to roaming food trucks, sorts these spaces into categories like Rustic Chic, The New Grandeur, and High Tech. The edible installation shown above is a treat for the eyes created by Dutch artist Marieke Van der Bruggen. These sugar branches hang from the ceiling like icicles–the artist experimented with different colors, flavors and sugars to create a colorful, sparkling forest of pure candy. 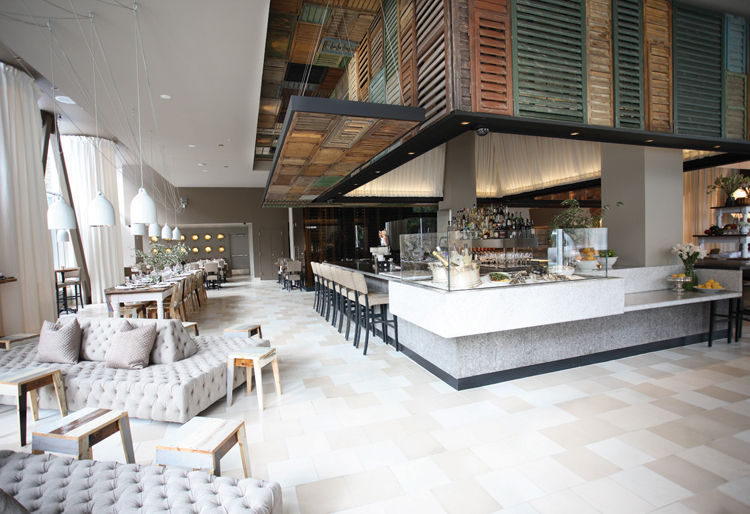 Here are some more of the interiors featured in Eat Out! Restaurant Design and Food Experiences. Two pavilions stand in an otherwise empty stone interior under the tall glass roof of Luxembourg’s Museum of Modern Art. 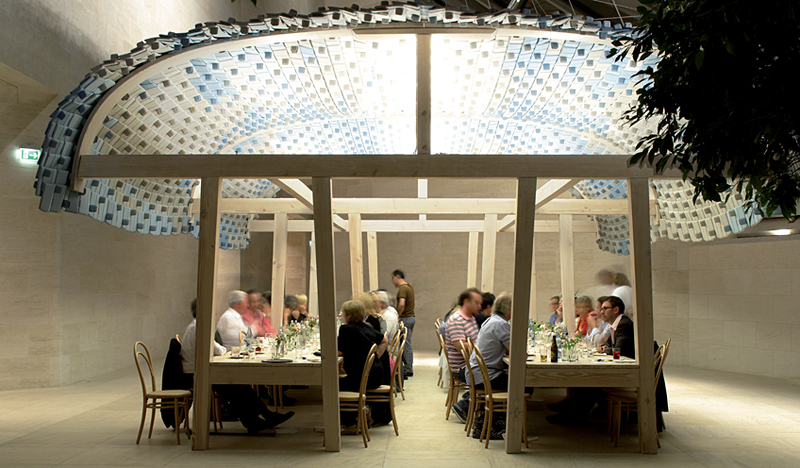 The pavilion, with its sound-absorbing tiles above, contrast nicely with the epic building surrounding it, creating a friendly, almost domestic atmosphere for diners. 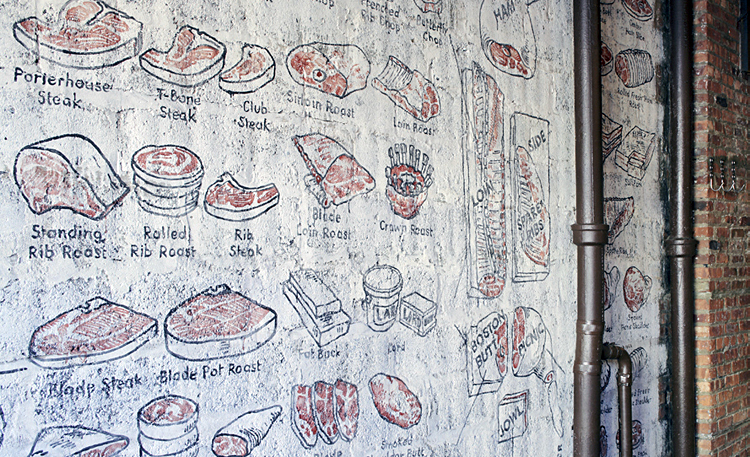 In Brooklyn’s trendy neighborhood of Williamsburg, carnivores come to feast at a meathouse whose walls are charted with illustrated cuts of meat. 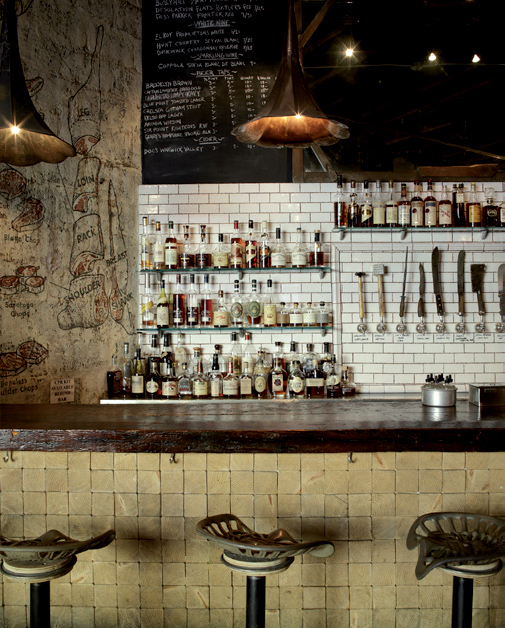 The rustic atmosphere is in the details, from the picnic tables and tractor-seat bar stools, to the phonograph lights and butcher-knife beer tap handles. Light plays a significant part in creating the tranquil mood of this hotel restaurant. 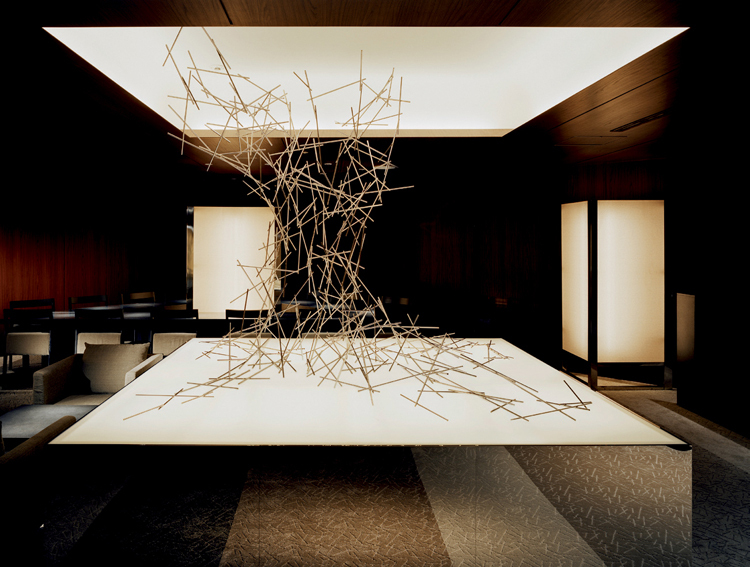 Metallic sculptures are illuminated throughout the space by backlighting and diffused light surfaces. 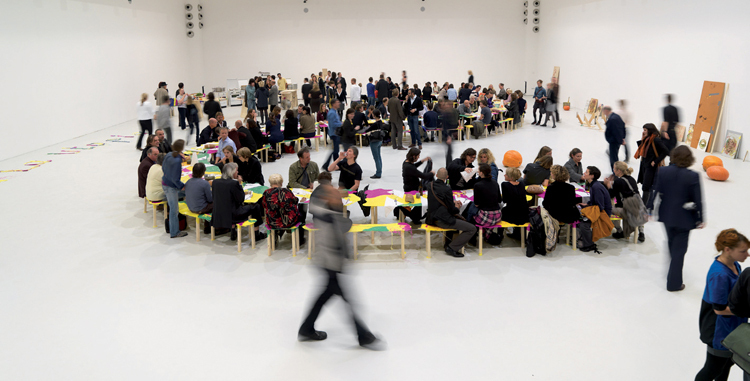 This workshop during the 2008 Vienna Design Week asked museum visitors to create the tabletops and benches on which they would dine. Wood and melted brightly-colored resins were made available for guests to participate in creating a colorful, unpredictable dining environment. 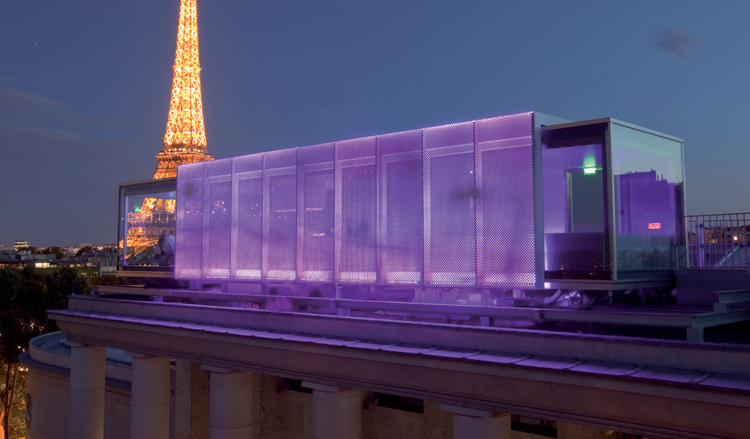 This tiny, movable restaurant is a temporary module placed atop the roof of Le Palais de Tokyo Museum in Paris. 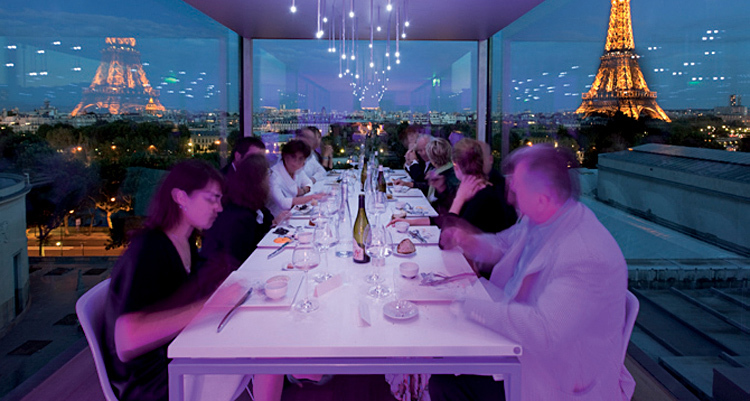 The glass cabin gives diners a panoramic view of the Seine and Eiffel Tower, and holds a central cooking area and a dining room that seats 12 people. Colored LED lighting and a perforated metal screen gives the space some texture, and–bonus!–the chef offers a new menu every day. Horse race enthusiasts can watch the races from this humorously designed temporary marquee at Melbourne’s Flemington track. 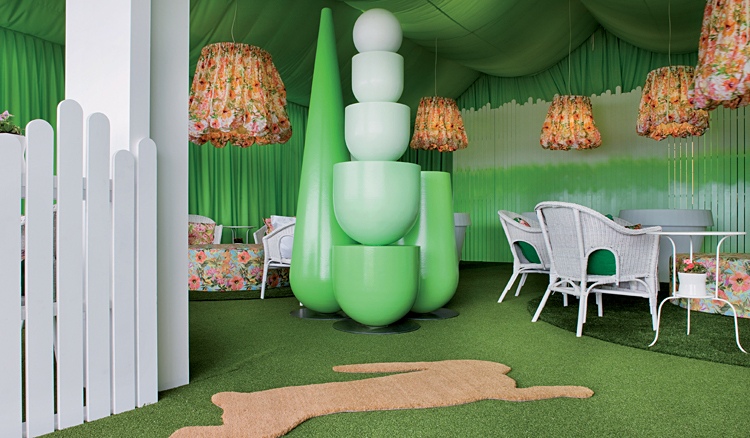 The designers intended to exaggerate elements of racing culture by playing with scale–giant white picket fences, oversized flowerpots, an abundance of floral patterns–while keeping some classic details like wicker furniture, English china, and ’50s-styled waitresses serving high tea. 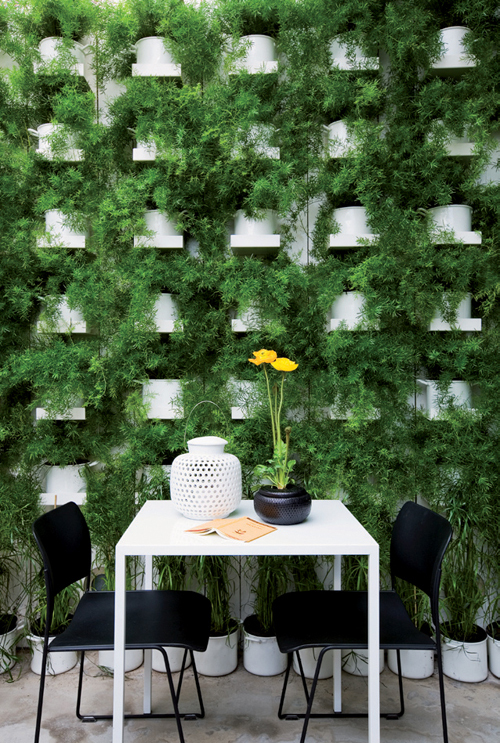 The different zones of this restaurant blend the inside with the outside with garden-party-esque details like delicately woven chairs, lush walls of greenery and flowers, and birdcage motifs on the walls. Rehberger’s dizzying cafe design is now a permanent feature of the Italian Biennale pavilion. The striking discord of black and white stripes, mismatched shapes, and fluorescent colors was in part inspired by visual effects used on military ships during World War I, and holds up with the recent ’80s revival influencing designers today. Consider that your appetizer?the book, on sale at Amazon for $46, dishes out many more dazzling restaurant interiors and creative dining experiences.